Travelling by horse or mail coach was for a long time the only way to reach the Flinders Ranges. Many of the early visitors and workers, walked or later used a pushbike to move around. It was not until the arrival of the railway in the Flinders Ranges that travel became a little easier, faster but not always reliable. At a government inquiry in 1860 it was stated that transport was 'often severely interrupted in consequence of want of feed and water, in particularly during the summer'. It was also suggested that the government should sink wells in different places along the main stock routes as the summer of 1860 had nearly ruined every team on the road. This meant that some of the settlers had been half starved from the difficulty of getting up supplies. As early as 1860 the first of several efforts had been made to survey a route for a possible tram or railway to the northern mines. One optimist even proposed to dig a canal from Port Augusta to Lake Torrens. He saw no difficulty in making the bed of Lake Torrens available as a canal as far as Mount Eyre. From there he thought that a tramway could easily be constructed along the side of Hookina Creek around the base of Rawnsley's Bluff to Wilpena. Transportation of supplies for mines and towns, remained one of the greatest and often most expensive problems. The terrain in the Flinders Ranges is rugged and bullock teams could only cover a distance of up to twenty kilometres a day. More often than not, it would be only ten kilometres and then only if water and feed were available. Even if or when these were available, most teamsters preferred to remain south of Port Augusta where there was plenty of work carting wool, wheat and copper. Teamsters were badly needed in the north, not only by the mining companies but also by the many pastoralists who had, or were, in the process of establishing their runs. Unfortunately teamsters and their bullocks were few and far between most of the time. They could obtain enough work from mining companies and station owners in the more settled parts of the colony. To get them to cart at all in the north astronomical cartage had to be paid, which often resulted in long delays to get any kind of produce down to Port Augusta or supplies up to the mines and pastoral stations. Passenger transport was also difficult. Those lucky to own a horse were able to travel much better and faster than those who had to rely on mail coaches. Several of these did take passengers, including the Northern Coaches which ran between Kapunda and Mount Remarkable. As early as 1850, James Chambers had the contract for delivering the inland mail, earning himself not only �250 per annum, but also the approval of the Postmaster General, John Watts, who said; 'The services of conveying the mails during 1850 has been well and satisfactorily performed by Mr Chambers'. Most of the mail, small parcels and newspapers for the people in the north came from Adelaide, more than five hundred kilometres away, often via Melrose or Port Augusta. On 2 July 1862 tenders had been invited for a fortnightly mail run between Angepena and Blanchewater, both of which were major pastoral holdings. From Angepena the mail was to go via Mount Serle and Mount Rose and on to Yudanamutana from where it then would continue to Blanchewater. The need for this postal service proved to be great at that time. After only six months operation the Post Master General, J.W. Lewis, was forced to ask the Chief Secretary to increase this to a weekly run, at least for the section between Angepena and the Yudanamutana mine. When this request was approved the run was broken up into two sections. The first part, running between Blinman and Yudanamutana via Angepena, was successfully tendered for on 3 December by William Rounsevell for a period of three years, starting on 1 January 1864. The second part, from Yudanamutana to Blanchewater via Umberatana, another large pastoral property, was contracted by William Carruthers from Nuccaleena, for the same duration and also starting on 1 January 1864 but on a fortnightly basis. For this he was paid �0. In June 1863 Robert Archibald Fiveash and many other claim and leaseholders petitioned the Government for financial help to the tune of �000 to �000 to improve the roads north of Port Augusta and provide water for the bullock teams. In another attempt to cut its huge transport costs even further the Yudanamutana Company bought three steam traction engines and shipped them from England to Port Augusta, where J. Anthony was put in charge. It also engaged John Lloyd Hyndman C.E. and his brother R.A. Hyndman for some time as licensed surveyors and civil engineers to determine and fix a route for the company's traction engines from Port Augusta to the Yudanamutana mine. John Lloyd Hyndman had previously worked on the Bombay and Central India railway for several years and also had acquired mineral leases in the Northern Flinders Ranges. When the engines finally arrived at the port, they proved to be a miserable failure. When another trial was made some weeks later the reporter wrote, I don't know whether it was what the engineer referred to as his proposed grand trial, but at any rate it was an unfortunate one, as in going through the sand in front of Tassie and Co.'s store with a train of trucks attached they stuck fast, and in their efforts to get out had the misfortune to break the hind bracket off the cast iron bed which carried the driving shaft, and as the casting is of considerable weight, it of course will cost something considerable to replace it. At Port Augusta the Yudanamutana company had also started building its own jetty for the loading and unloading of copper and supplies, and appointed G. Davies as its agent at the port. As a previous attempt by the Great Northern Mining Company to build a tramway from Port Augusta to the Northern Flinders Ranges had been unsuccessful, the Yudanamutana Company now looked for the South Australian Government to undertake this task. Unfortunately for them, and many others, the Government was both unwilling and unable to start such a project of that scale. As early as 1860 Henry Ayres had made his opinion very clear on this point. When asked if it would be beneficial to the community to construct a tram road he replied in great detail; I don't think anything would justify it at present; and I think the experience of rail roads and tram roads in this country is that the cost of working them is nearly equal to that of common roads. We have now the railroad to Gawler Town and Kapunda; but there has not been the cheapening of traffic which followed the introduction of railroads in other countries. We have never found it worthwhile to use the rail road... at this early period, I should not think it beneficial to construct a tram road. One wonders whom Ayres was representing here. Was he speaking on behalf of the South Australian Government or was he constructing an argument in favour of the South Australian Mining Association, which operated the Burra mine, and was afraid of possible competition? The best the Government could do, and did, was to sink wells along the major transport routes in the Northern Flinders Ranges. The idea of sinking wells had first been suggested by G.W. Goyder in July 1857 when he compiled a report of his exploration in the north of South Australia. One of the results of sinking wells was that the Government planned townships near them. Consequently 1863 saw the surveying of Parachilna, Mern Merna, Mount Eyre, Edeowie, Yarrah and Hookina, where Edward Thompson Braddock already operated a store. He was one the earliest pioneers, in the Northern Flinders Ranges, who cashed in on the trade provided by the passing bullock drivers. Regardless of this small improvement, the cost of cartage between Port Augusta and the Yudanamutana mine were increasing all the time. By the end of the year the company had to pay out � per ton for transporting its goods across the western plains and into the mountainous mining site. In 1864 the mine was forced to stop production due to several reasons. One of them was obviously its great distance from a harbour. Another one was the high transport costs, which had sky rocketed to � per ton. There were still other problems though. At times swollen creeks held up the mail coach after violent thunderstorms. During a January flash flood the mail coach was swept away and driver and passengers had a rather wet and cold night camping on the bank of the creek. Next morning only three wheels could be found a few kilometres down the creek, the coach itself being completely destroyed. Twenty years later Madeline Elizabeth Hayward drowned at Wilmington on 12 May 1884, her ninth birthday, when the coach she was travelling on overturned in a flooded creek. In 1869 a Select Committee, formed to look into the problems of the Flinders Ranges, reported that it was exceedingly rich in mineral deposits and offered a rare opportunity for the profitable investment of Capital. It found that the Blinman mine supported a population of 1,500 persons, and that if transport were offered, many mines of equal or superior value could be worked immediately. Therefore, it was of the utmost importance that a railway should be constructed. The only help afforded by the government had been the sinking of wells along the major transport routes. As a result of the large and continuous amount of traffic it did not take long for a hotel and store to be opened at Edeowie in 1863, to cater for the thirsty bullockies and other travellers between Port Augusta and Blinman. Finally in August 1867, the Governor of South Australia when opening Parliament said that it was desirable to bring in a bill to encourage the formation of a line of railway northward from Port Augusta. In 1869 a Camel Transport Company was formed using one hundred camels and thirty donkeys to operate between Beltana and Port Augusta. But on 19 February the Advertiser still carried an ad asking for fifty to a hundred horses or bullock drays to cart ore from the Mount Lyndhurst and Mount Burr mines to Port Augusta. Agitation for the construction of a railway to the north, first suggested in 1860 now became much stronger. Railways either opened up the country ahead of settlement or followed it. They reduced transport cost and isolation for the many farmers, pastoralists and miners, making it possible to compete on local and world markets. By 1870 almost everyone in the colony was convinced that the only way to make the north prosperous was to build a railway. Referring to the Mount Rose mine, Captain Absalom Tonkin said 'I believe this mine would be a very productive mine if properly worked, were it not for the long transit'. The local newspapers were in full support of this railway and pointed out that a northern railway would make great mines such as the Daly, Stanley, Yudanamutana, Mount Burr, Mount Lyndhurst and the Mount Rose payable. Another paper commented that 'if the railway scheme is carried out it will be found that the mineral resources in the North will exceed the most sanguine expectations of those who have said so much about it'. But not so John Rounsevell; he was not at all impressed with the proposed line from Port Augusta to Beltana passing Mount Deception. He thought that Mount Deception would be an appropriate name for the railway line as it would be in the wrong place and prove a lasting disgrace and loss to the colony. When the railway was completed up to Beltana in 1881, it very soon became obvious that it was not only costly, inefficient and unreliable, but also an embarrassment and a disgrace. Although the line is still used for Leigh Creek coal, it was re-routed a hundred years later. Passengers and freight now go via Tarcoola, but it had not reached Darwin until 2004, its intended destination. While the arguments continued in parliament, and promises were being made, they brought little benefit to the mining industry. The smaller mines, and even big mines like the Blinman and Sliding Rock, found it hard to overcome their transport problems. Two years later in April 1872, J.B. Neales moved during the parliamentary debates that in consequence of the non-completion of a railway from Port Augusta, and the absence of any made road to the northern mines, the Government be recommended to amend Act 3, 1869/70, by a further remission of rents of another three years. He also made it abundantly clear to the members of the Legislative Council, that mine owners could not make a profit under the terms of the existing leases. H. Mildred added to this that up to � per ton had been paid by mine owners to bring stores to their mines, and as much as � per ton for carting the ore to the port. By 1874 still nothing had eventuated as far as building a railway was concerned. On 5 August a petition from 122 residents of Cadnia was presented to the House of Assembly 'Humbly praying that a railway would be constructed immediately from Port Augusta to Beltana, or any other point further north as the high price of cartage, and the delay caused by the sometimes scarcity of feed for the cattle of teamsters, proved a great drawback to the prosperity of the Sliding Rock mine and the tradespeople residing here'. When in 1875 Ebenezer Cooke and some fellow parliamentarians became convinced that the government was at last going to pass a bill for the construction of the long talked about northern railway line, they saw a chance of making a lot of money in a very short time. They were instrumental in the formation, in England, of the United Mines Company, which was incorporated with a proposed capital of $500,000, made up of 50,000 shares of $10 each. The company was to buy a large number of existing mines, along or within a short distance of the railway line, which had been contemplated as early as 1860. These mineral properties included Mount Rose, Mount Emily, Mallee Hut, Beltana, Lake Torrens, Napoleon, Warrioota, Mount Lyndhurst, Vocovocanna, Nepowie and the Moolooloo mines. The railway was started in 1878, but did not reach anywhere near these mines until 1880. Consequently very little work was done. Even so, the railway had proved beneficial up to a point at least, for without it the Yudanamutana copper field would not have been working at all. When the northern railway was finished it soon became known as The Ghan, named after the Afghan cameleers who did so much to open up Central Australia. For many years camel teams supplied the telegraph, railways and pastoral stations with supplies, no matter how isolated or far away they were. They worked the Queensland road, which later became known as the Birdsville Track, as well as the Oodnadatta and Strzelecki Tracks. Afghan camel drivers went as far as Wyndham and Newcastle Waters to cart supplies to stations which had no other means of fast and efficient transport. The camel trains were also involved in the establishment of artesian bores. They plodded down the many tracks bringing supplies and returning with wool or any other product. The Ghan eventually ran from Port Augusta via Saltia, Pichi Richi, Quorn, Willochra, Gordon, Kanyaka, Wilson, Hawker, Hookina, Mern Merna, Edeowie, Brachina, Parachilna, Beltana, Copley, Farina, Marree, Curdimurka, William Creek and Oodnadatta to Alice Springs. Construction of this narrow gauge line started in 1878, at the height of the railway boom, in the hope to develop the pastoral and mining potential of the inland. The railway went through some of Australia's most desolate and flood prone country, often suffering washouts with passengers marooned for several days. By 1881 it had reached Beltana. Within two years it reached Farina and by 1884 Hergott Springs (Marree) had become the railhead. After some years the line was pushed further north past Callana, Alberrie Creek, Curdimurka, Coward Springs, Strangways Springs, William Creek, Anna Creek, Box Creek, Edwards Creek, Warrina, Algebuckina and Mount Dutton until it finally reached Oodnadatta in 1891. Oodnadatta remained the railhead for the next forty years. In an effort to advance the line and get construction going once again, it was stated in 1895 'that the interior was not all desert, but had extensive areas of good land fit for cultivation and a variety of tropical products'. It was not until 1929 when the line was extended to Alice Springs, and there it has remained until today. During its more than hundred years of service it has carried anything and everything, including some 18,000 service men and equipment during the Second World War. The railway made cattle transport easier and cheaper, but flash floods and extreme climatic conditions made the line anything but reliable. In the end flood damage to rails, culverts and bridges and consequently unreliable timetables resulted in the construction of a new standard gauge line in 1956. It was a major improvement but the line bypassed the Pichi Richi Pass, Quorn, Hawker and Beltana, severely reducing the number of employment opportunities. 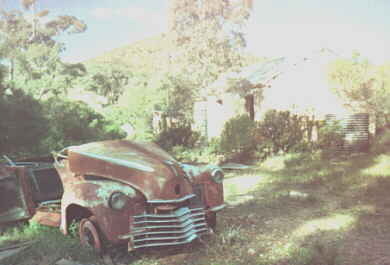 Even before the demise of the Ghan, most of the transport in the Flinders Ranges had been taken over by cars and trucks. With the improvement in roads, cattle and sheep could be loaded at the station reducing the need for droving stock to railheads. The use of the personal car and bus services to the main centres meant fewer and fewer people using the rail services. Steam trains now provide trips, for tourists and railway enthusiasts, through the Pichi Richi Pass. The Great Northern Railway, or The Ghan, never lived up to the many promises made, or the financial success that had been envisaged. It ran for the last time in October 1980 when the new line via Tarcoola was completed. This marked the end of an era and a significant chapter in South Australia's railway history. As can be seen work has finally started on the long awaited line from Darwin to Alice Springs.